Austria is a culturally diverse country with a rich history which offers some of the most breathtaking locations in the world. The majestic Austrian landscape has been a popular shooting location for decades, and Mission: Impossible- Rogue Nation, starring Tom Cruise, Season of the Witch, starring Nicolas Cage, 007 - Spectre, starring Daniel Craig are just some examples of major Hollywood blockbusters that have been shot here over the past few years. Due to its extremely diverse geographical landscape,every region of Austria offers gorgeous locations for films, from the snow-capped peaks of the Alps, to sunny Carinthia, a mild, southern province. Next to its beautiful landscapes, Austria’s most notable strength is the excellent infrastructure, found in even its most extreme locations. We have put together everything what is to know about the geography, accessibility, and climate of this beautiful Central European country for those who are considering Austria for potential productions. Austria lies in the southern part of Central Europe, along the upper reaches of the Danube, where oceanic and continental climates both show their influence, and all four seasons reveal their individual characteristics. Summer is usually hot and dry, and the winter months are rich in snow, which remains on the ground for months. In the eastern regions the summer is hot, and sees little precipitation. In the mountainous regions, there is much precipitation, while the protected, southern Vienna Basin is known for its sunshine. Northern regions see under 1500 hours of sunlight per year, while the rest of the country sees an average of 1850 to 2100 hours of sunlight per year. In the southern regions of the country, winters are mild and summers are hot, making places like the province of Carinthia popular recreation destinations. Half of Austria’s territory is covered by tall mountains, a third by middle sized mountains, and only one sixth of the country is made up of hills and basins. The tallest point in the country is the Grossglockner, and the lowest is Lake Neusiedl. The climate is basically continental, which is significantly affected by the altitude. In Austria, climate conditions vary, but are also predictable, which is positive when it comes to productions. Often, much of Austria is covered with dense fog, but in the Tyrol, clear, sunny weather is common. Fog is usually common in fall, and mostly in low-lying areas near lakes or in basins of Upper Austria, as well as in the valleys of Central Austria. Vienna is usually three to five times more likely to have foggy conditions as Innsbruck, where they only have about 20 foggy days per year. The narrow valleys and steep mountain sides of the Tyrol region are responsible for this phenomenon. In the morning a thick fog rolls over the Tyrolean valleys, but as soon as the sun comes up, the mountainsides begins to bake, quickly warming the air and dissolving the fog. Because of this (fortunately for skiers) winter conditions in the Tyrol are clear. The phenomenon called Foehn wind is quite common in the region of the Alps, which creates extreme weather conditions. This occurs when on one side of a mountain the air rises, cools down, loses its moisture, then tumbles over the mountain’s spine to the other side, where it descends as warm air. This leads to snow melting, which is why Foehn wind is also called snow-eater. This leads to such extreme weather, that often in October there is nearly summer heat in the region. The climate in Austria 's southernmost province, Carinthia, is a mild, Mediterranean climate, but many people overestimate its impact . An important feature in these valleys is an inversion of the winter climate, which means that at an elevation between 1000 and 1400 meters, the temperature is often up to 15°C higher than in the valleys under 1000 meters. The temperature in the valleys fluctuates annually between 20 and 24°C , while just between 14 and 20°C in the mountains. In the area surrounding the Carinthian lakes, water flows from the South to the North due to its location, protecting the region from poor weather. From June to September the temperature near the coast often exceeds 28 degrees (Celsius), and this summer weather usually lasts well into the autumn. The Alps, one of the greatest mountain ranges in Europe, spans 7 countries (Slovenia, Austria, Italy, Switzerland, Liechtenstein, Germany, and France). The way the mountains are utilized varies from country to country, for example, the Austrian Alps are considered a ski paradise, while the Bavarian Alps are more famous for year round hiking and climbing. Of course, this is largely determined by consequent geographical features. The breathtaking Alpine landscape was just one of the many reasons why the filmmakers decided to shoot 2015’s Wie Brüder im Wind (Brothers of the Wind) in East Tyrol. The film tells the story of the relationship between an unhappy boy and a golden eagle, and stars well-known actors like Jean Reno, and Tobias Moretti. Visuals, as well as working in a snowy, peaceful environment where no tourists would disrupt the work was very important to the creators. In fact, the Tyrolean residents and the employees of the Hohe Tauern National Park proved to be very helpful in finding the locations for the film. Every helping hand came in handy during filming, as not only meadows, but more extreme mountain locations were used, where it was very difficult to take crew members and equipment up there. The filmmakers invested a lot of time and energy into taking many shots, capturing different points of view, using drones, helicopters, and eagle-cams to film the birds. They were able to capture exceptional events, like the struggle between a golden eagle and a chamois. For cinematographer and nature photographer Oliver Penker, shooting this film was like winning the Olympic gold. Of course, to get this footage, the filmmakers had to live like the animals, monitoring their behaviors while remaining unnoticed, even in -25 degree Celsius weather. Austria is largely set in the Eastern Alps, whose valleys many have rivers running through them, like the Inn, the Enns, the Mura, and the Drava. These river valleys are considered to be important transportation routes. For instance, the Inn originates in the Swiss Engadin, and flows through the provincial capital of Tyrol and the Alpine city of Innsbruck on its beautiful 510 km path to the Danube. The Charm of Austrian mountain ranges lie in the diversity of their natural surroundings. Next to oak, beech, and red pine trees, the forests at the feet of the mountains also give home to alpine flowers, such as gentian, alpine rose, saxifrage, and the rare edelweiss. After the snow melts in March, flowers begin to grow in the the Tyrolean valleys, despite the temperature in the morning and evening dropping below freezing. Due to the fact that skiing is Austria's national sport, the Austrian Alps have over 7,200 kilometers of ski slopes serviced by 260 chairlift companies. The coldest, snowiest period in the Alps is from late December to late January, during which there is very little sunlight, and snow levels can reach as high as 20 cm. Skiing conditions are most favorable toward the end of February, when the sun shines more and more, but by March it becomes a bit slushy. At above 3000 meters, where the average temperature is still below 0 degrees like the Hintertux glacier, skiing is possible even in June. Austria, next to its ample mountains, is rich in lakes as well. Austrians insist that their waters are so clean, that you can drink from them. Carinthia, the country’s southernmost region, is home to over 1270 lakes, 200 of which have resorts and beaches on their shores. The lakes of Carinthia cover over 60 square kilometers, the 4 largest lakes: Wörthersee, Millstatter See, Ossiacher See, and Weissensee, taking up 50 of the 60 square kilometers. Wörthersee, the region’s largest lake, became one of the most frequented destination for watersports in the past years, earning its northern shore the nickname: “Austrian Riviera.” The lake rests in a basin in the Carinthian foothills. It is full of islands and peninsulas which split the lake up in three parts. The deepest (and cleanest) lake in the Alps is the 141 meters deep Millstatter See, which is located 930 meters above sea level, at the foot of the Latschur (2236 m). Here swimmers can see up to 12 meters below the water’s surface, and is part of a strictly protected system of lakes due to its impact on the region’s climate. Naturpark Weisensee is a firm believer in sustainable transportation. Cars are strictly prohibited, instead, environmentally friendly busses are available between 8:30 AM and 8:30 PM. The wonders of Weissensee can be seen on the big screen in the 2016 feature film Ein Sicherer Ort, which was filmed over a 10 day period by a 50 person crew on the lake’s southern coast. The crew worked closely with members of the local diving school, who provided gear for the underwater scenes, and followed the crew on a 9 meter long catamaran. Furthermore, for safety reasons, two divers were assigned to assist the cinematographer at all times, and the local fire brigade was on standby for scenes where explosive materials were used. 630 of the Carinthian Lakes are situated over 1000 meters above sea level. The lakes located higher up in the mountains can be frozen over 8 months a year, and the Grandensee, which lies at an elevation of 2488 meters in the Schobergruppe, can be under a thick layer of ice for 10 months a year. Carinthia is not only called the “realm of waters” due to its lakes, but also because of the overwhelmingly beautiful waterfalls found in its straits and ravines. Well known examples are the Tscheppa Gorge, home of the Devil’s Bridge and Tschauko Falls, and the romantic Ragga and Gaisloch gorges located in the Drava River Valley. The Fallbach, one of the country’s largest waterfalls, at 200 meters is also considered its most beautiful. Many times these natural beauties are located in harsh, hard to reach areas, and are only accessible by tunnels and rope bridges. Lake Neusiedl, Austria's largest lake, is surprisingly not located in the province of Carinthia, but near the northwestern border of Hungary. The 36 kilometers long and 12 kilometers wide lake is often called the "Sea of the Viennese" because of its warm, brackish water. The region surrounding the lake in one of Austria's warmest, with 60 days of summer per year, making it excellent wine country.. Due to the diversity of animal life the surrounding region offers, wildlife observatories can be found at different points. The lake and the national park of the same name has since been named a World Heritage Site. The Vienna Basin is located south of the Danube, west of Vienna Woods, bordered by the Semmering and Bucklige Welt in the south, and covered by the Rosalien and Leitha Mountains in the southeast. The region is known as Lower Austria’s southernmost wine region, mainly due to the mild Pannonian climate. The center of the region is Baden, where thermal resorts (like Bad Vöslau) utilize the health benefits of the natural hot springs that bubble to the surface. The game rich forests of the Vienna Basin were owned and hunted by imperial royalty until Emperor Joseph II. made it public to his subjects in the mid 18th century. The 135,000 hectare area is home to 2000 types of plants and 150 different bird species, and was declared a UNESCO Biosphere Reserve in 2005. The forest floor absorbs a significant amount of precipitation, thus reducing the risk of flooding in the area, and ensuring good air quality, and reducing chances of excessive temperature swings. Temperature conditions in the Vienna Woods (and Vienna itself) is determined by the western winds. These winds act as climate control, blowing through the forest, supplying the city with fresh air. The part of the Vienna Basin which lies south of the Danube is a hilly region, characterized by fertile fields, forests, and meadows. This is also one of Austria’s most densely populated regions, with a population of 1000 people per square kilometer and is the most important region economically as it is home to the chemical, plastics, textile, metal, stone, glass, and food processing industries. Vienna and its surrounding areas have a centuries-long imperial history, this is why so many castles and royal palaces are found in the region. One of the most impressive and popular filming locations in Europe, the Laxenburg Castle, is located just 15km away from Vienna. Due to its proximity to the Schönbrunn Palace, it became a popular winter and summer residence of the imperial family, and by the 18th century had developed into a focal point of court life. The 280 hectare park around the castle is the epitome of 18th and 19th century design, and is a historical monument today. One of the most famous building in Austria is the Franzensburg, which locals call "the small treasure house”, and was built on an artificial island by Holy Roman Emperor Francis II. to resemble a medieval castle. Empress Sissi also frequented the castle in her spare time, and spent her honeymoon here with her husband, Franz Joseph, and Crown Prince Rudolf and Princess Giselle were both born in the castle. Several series were filmed here such as, children’s series Tom Turbo and crime series Schnell ermittelt. Around 20 km from the Austrian capital Vienna, is the beautiful settlement, Klosterneuburg, which is extremely rich in historical monuments. It is home to an Augustinian Monastery, which was built is Gothic and Baroque styles, and has become one of Austria's most important cultural centers. The monastery was founded by Malgrave Leopold Babenberg III. and took over 100 years to build. The monastery library contains over 45,000 rare manuscripts and volumes, and houses Austria's oldest winery. The wine-making began with the foundation of the abbey, and became the primary income of the monks living there. This 108-hectare piece of land in Klosterneuburg, remains Austria's largest winery. A decent amount of the medieval walls and towers are still visible today, and the abbey garden, which houses many plant rarities can also be freely visited. 23 km to the north of Vienna, above the Danube River Valley lies Kreuzenstein Castle, which was built by Counts of Formbach in the 12th century, later becoming the domain of the Habsburgs. Strategically built in the highlands of the Rohrwald Forest. During the Thirty Years' War Swedish troops laid siege to the castle and almost completely destroyed it. 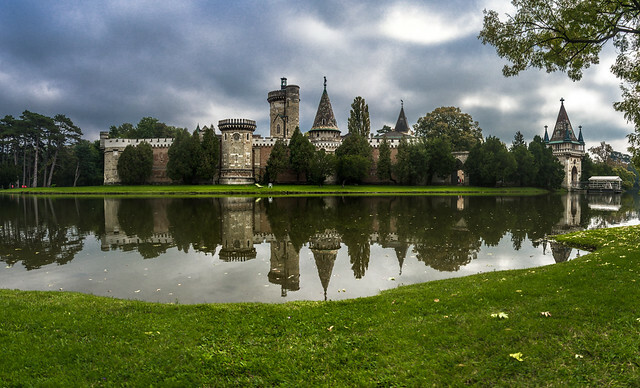 In the 19th century, Count Johann Nepomuk Wilczek began rebuilding the castle in the Romanesque Gothic style. Precious Gothic relics are still preserved in the wings of the castle, such as an ancient baptismal font, stained glass windows and a door that is almost 1,000 years old. Even more interesting are the medieval kitchen and torture chamber found in the castle, or the largest medieval weapons collection in Austria. The picturesque Kreuzenstein can be seen in numerous horror films from the 50’s and 60’s, many big budget historical dramas, and a few Hollywood blockbusters as well, like Season of the Witch starring Nicolas Cage. Although there are a number of medieval castles and ruins in lower Austria, accessibility is not always easy. The ruins are usually located at high elevations and are surrounded by forested, rocky terrain (Rauhenstein Castle) Most of the old forts operate as hotels, (for example, the Wildegg Castle) and the rest can only be visited if you make an appointment (Heidenreichstein Castle). Although Austria’s territory is quite small, the diversity of its natural landscape is vast. Shooting conditions on a mountaintop in the Alps varies greatly from Lake Neusiedl, for example, and requires a completely different kind of local knowledge. The Progressive team always strives to provide the most up to date and accurate information about conditions at all of these locations. Are you ready to be guided to all the unique locations by the Progressive Crew? Interested in what kind of production services we can offer you in Austria? Click here for more information.